"The winner of the Best in Show award [at the 39th Juried Exhibit at The Parrish Art Museum in Southampton, NY] works wire into implied and literal shapes that incorporate language....The coils of the furniture imply that it is the frame or core of the pieces that is exposed. The body and the furniture have been stripped of their skin and fabric to reveal a more essential message." "Naomi Grossman's wired configurations, voted Best of Show [at the Thirty-Ninth Juried Exhibition at the Parrish Museum]...the connotation that the words suggested: an aging relative's whispered thoughts entrapped in both a lonely place and state-of-mind." "'Breastplate for the Preservation of the Self', a wire wall piece by Naomi Grossman [at the 49th Exhibition of Long Island Artists at the Heckscher Museum of Art], weaves a delicate web of words into a protective mesh that both shields and reveals the imaginary wearer." 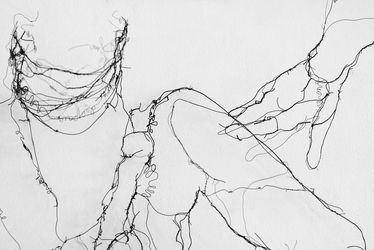 "Ms. Grossman's wire constructions [at the Omni Gallery's show, Inner Self] might be described literally as body language. Woven into the shapes of figures and domestic objects, they comprise words and phrases that express unspoken thoughts and feelings. They symbolize neural networks transmitting a barrage of data aimed at communicating fundamental needs for love, comfort, attention--that resonate even when all externals have been stripped away." "The words and images as well as the casts [from Reminiscences: Shreds of Memory at the Project Room of the East End Arts Council] are arranged around the room and excerpts from the audiotapes provide a compelling sound tract for this intimate history lesson. This project affirms the value of listening to and learning from, one's ancestors." "...Grossman's sculpted works in wire...[at the ALLI Invitational Inaugural Exhibit] invite the viewer into a woman's heart." "The top award [at the Heckscher Museum of Art] went to Naomi Grossman's 'Psalm', a construction that weaves the words of a Biblical verse into a chicken-wire framework that forms an ephemeral torso, its head an empty shell. The prayer carried by the filaments has nowhere to go....Ms. Grossman's piece has...[an] eerie feeling of electrical energy frozen in space."